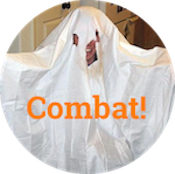 celebrity children Archives - Combat! 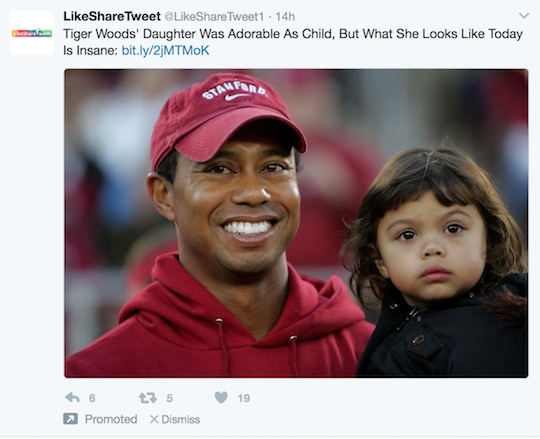 Close Reading: What Tiger Woods’s daughter looks like today is insane! I did not click on the Twitter ad pictured above, out of fear for my soul. There’s something about the come-on “Tiger Woods’ daughter was adorable as a child, but what she looks like today is insane” that leaves me cold. Probably, it’s the part where I get ready to see how insane someone looks. That’s just the kind of thing I want to see, and also just the kind of thing I want to stop wanting to see. All it took to push me over the edge into decent behavior, in this case, was a chubby-cheked little girl. I submit that our visceral revulsion to clicking on the link in this advertisement tells us something about our values. It gives us a glimpse of our urges and the flickering scruples that hold them back, and it’s the subject of today’s Close Reading.